Biography: Dr. Frisbee completed his PhD in Biophysics (Physiology) from the University of Guelph. 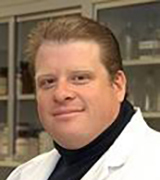 Following postdoctoral fellowships at the University of Washington (Cardiovascular Bioengineering) and the Medical College of Wisconsin (Microvascular Physiology), After several years as an Assistant Professor at MCW, Dr. Frisbee was recruited to the West Virginia University Health Sciences Center in the Department of Physiology and Pharmacology. Subsequent to the establishment and expansion of his research program at WVU, Dr. Frisbee was named as the Director of the Center for Cardiovascular and Respiratory Sciences and for the Clinical and Translational Sciences Doctoral Program. Dr. Frisbee also serves as the Editor-in-Chief of the journal Microcirculation, and has extensive experience on study sections for the National Institutes of Health, the American Heart Association and the American Diabetes Association. Research Areas:Skeletal muscle and cerebral microcirculation, regulation of tissue/organ blood flow, impact of elevated cardiovascular disease risk on microvascular function, vascular disease with chronic stress and depression, microvascular regression with cardiovascular disease, application of chaos theory to microvascular network function.